Times of India - Keeping aside the fact that ToI news is the equivalent of a burger and fries (food with no serious content), there's no political affiliations of the owning entity of the Times Group. Indian Express - The current editor-in-chief of the Indian Express is Rajkamal Jha who is Sanjay Jha's cousin. Sanjay Jha is a national spokesperson of the Indian National Congress. Hindustan Times - Owned by the HT Media Group, whose Chairperson is Shobhana Bhartia. Shobana is a member of the Rajya Sabha nominated by the Congress and is an active party member as well. Lokmat - The current editor-in-chief is Vijay Darda who is a member of the Rajya Sabha nominated by the Congress and is an active party member as well. Sakal - The current editor-in-chief is Shriram Pawar. Need I say more? I don't since I wouldn't want to disappear overnight. "The biannual report by Facebook has revealed that Indian government requested the most to take down a post from the social networking website as they were violating Indian laws"
We have included instances in which we have removed content that governments have identified as illegal, as well as instances that may have been brought to our attention by non-government entities, such as NGOs, charities, and members of the Facebook community. In the first half of 2015, India accounted for 15155 restriction requests. With a user base of 125 million as of Jun 15, that's 0.0121% posts restricted per user. Compare that to the United States with 26579 restricted posts across a user base of 151 million which translates to 0.017% restricted posts per user. We're no better or no worse than the "world's leading democracy" (actually a little better). Such a meager difference need not warrant a news article with the striking title and the tags #facebook and #NDAGovernment. That's yellow journalism at its yellowest. In any scenario, we needn't really compare the two countries in the first place. The disclaimer itself renders the data suspect and we need one more level of drill-down to bifurcate actual governmental requests and those from NGOs, private entities and users. Big Brother might just be our own filthy minds who take offense at the drop of a hat rather than the government. This is just one example amongst many. 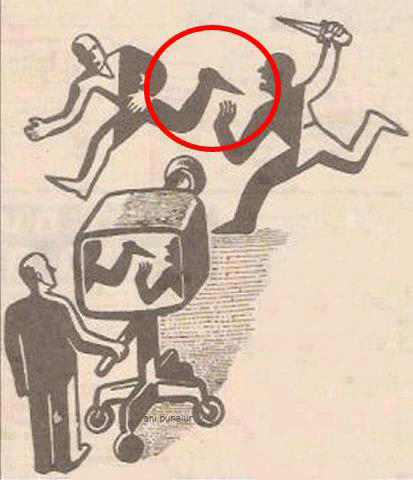 Every day we are presented with slanted news that builds an opinion rather than neutral news that presents facts. You either get a circus in the form of television news or you get yellow and/or biased journalism in the form of the print media. It's a scary thought when you consider the fact that public opinion is sometimes made by a select few people with political agendas. The current #intolerancetussle and #beefbans are perfect examples of how media has created issues where there were none. Only when we realize this charade for what it is and remove ourselves from the circus will we be able to pull ourselves away from this vicious cycle of manufactured prejudices and lazy opinions. It can be done too. Since 2012, I have not read a newspaper at all. It is very rarely that I switch on a news channel. I know their facts are twisted and I know their opinions are worthless. What's the alternative? Digital media. You have so many apps where you can choose your content. Where you don't need to depend on specific sources to get to the bottom of any news. Take for example - news.google.com. It has so many options to customize content and sources. I've completely replaced print media with Google News. You can choose from a host of sources and you can check the authenticity of those sources as well. We may as well realize that a completely unbiased opinion is hard to get as well. There's always going to be grey areas and there's always going to be a doubt about the authenticity of a source or the accuracy of a data point. But the fact of the matter is that as educated citizens, we can at-least use technology to force ourselves to search, think and analyze content in order to form a more well-informed opinion than the trash we were/are force-fed all these years before digitization took over. It's time to question the source.